Successfully Added Ordro S10 Smart Sport Bracelet - Calorie Counter, Blood Pressure, Heart Rate, Sleep Monitor, Pedometer, Bluetooth (Silver) to your Shopping Cart. Work towards a healthier future with the Ordro S10 Smart Sports Bracelet. Coming equipped with a hand full of health features, this sport watch is the perfect health accessory that motivates you to work towards reaching your future exercise goals. Featuring a weatherproof design, this sports watch is splash resistant, allowing you to wear it no matter the weather condition. From now on nothing will stand between you and your exercise goals as the Ordo S10 Smart Sports Bracelet will be there to constantly remind and motivate you to get through your upcoming workouts. 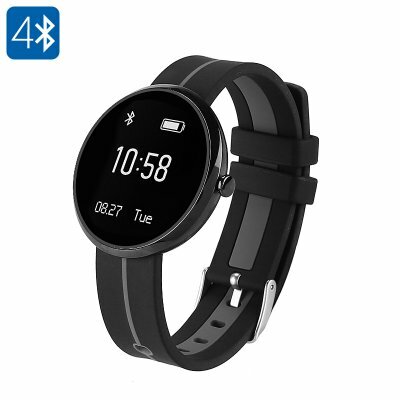 Supporting a highly accurate pedometer, this Bluetooth sport watch keeps actively track of all the steps you take during your upcoming exercise. Not only does it provide you with a great insight into your activity levels, it also shows you how many calories you have burned throughout your past workout. By providing all this information you will be capable of efficiently keeping track of your current health and stamina levels and how these are improving over time. Additionally, this smart sport watch also features a sleep monitor that ensure that you will get the right amount of rest needed for a fast and full recovery. From now on you’ll be able to work on your health even while not actively exercising. Equipped with a state of the art heart rate monitor, this sports watch allows you to keep track of your activity level at any time of the day. Being able to analyze your heart rate provides you with the possibility to optimize each and every workout in order to achieve your goals in the fastest and most efficient manner. The Ordro S10 sports watch furthermore supports a blood pressure test that gives you a great insight on your current health status. All this information combined provides you with a solid background based upon which you can optimize your own, personal, training schedule. With its ultra-bright 0.95-Inch OLED display, this sport accessory provides you a clear and detailed image even while exercising outside in direct sunlight. Displaying all the information needed during your workout, this health watch motivates you to take the absolute most out each and every work out. Thanks to its Bluetooth connectivity this watch furthermore allows you to sync it with your smartphone after which it will provide you with updates on incoming phone calls and text messages, ensuring that you’ll never miss out on an important chat again. The Ordro S10 Smart Sports Bracelet comes with a 12 months warranty, brought to you by the leader in electronic devices as well as wholesale electronic gadgets..